Jojoba oil is produced from the seeds of the Jojoba plant, a shrub native to the South West USA and now also grown in the Middle East. The oil makes up approximately 50% of the Jojoba seeds by weight. Jojoba oil appears as a clear golden liquid wax and among oils it is unique because it does not contain triglycerides unlike most other vegetable oils. Jojoba oil is used as an additive in many cosmetic products, especially those marketed as being made from natural ingredients. In particular, such products commonly containing jojoba are lotions and moisturizers, hair shampoos and conditioners, or the pure oil itself may be used on skin or hair. Recently Jojoba is explored as a source of bio-fuel since it has an attraction – the Jojoba plant can be grown in saline soils, and in desert lands. In fact, Jojoba is considered as one of the most practical and profitable solutions for desert plantation. Hot summers, warm winters, desert soil, minimal water, great salinity tolerance, lesser possibilities for infection, lesser need for fertilizers and generous financial income are all valuable characteristics of the plant. Jojoba oil has a unique composition of almost pure heavy esters with two double bonds. Professor Gabriel Lemcoff from the Ben Gurion University in Beer Sheva Israel is exploring its unique features while performing various novel organic synthesis experiments with this oil. Professor Lemcoff provided a pure Jojoba oil sample and asked Prof. Amirav to help with its analysis since it can not be analyzed by standard GC-MS (being too heavy and without expected molecular ions) or LC-MS.
We were able to analyze the pure oil and its chemical reaction products (which are not shown in this report) using the Aviv Analytical 5975-SMB GC-MS with Cold-EI, and in this post we present the Jojoba oil analysis results and conditions. System: 5975-SMB GC-MS system of Aviv Analytical which is based on the combination of Agilent 5975 MSD with the Aviv Analytical Supersonic GC-MS technology (GC-MS with Cold EI). Injector: 280ºC injector temperature with Pulsed Split injection at 50 PSIG. Sample: Pure Jojoba oil diluted to 0.1% in cyclohexane. He column flow rate: 8 ml/min with flow program to 24 ml/min at the end of the run. On column amount: ~100 ng of the total oil. Oven: 50ºC followed by 20ºC/min to 330C and wait 3 min for total of 17 min. SMB transferline temperature: 250ºC with temperature program of 10ºC/min after 8 min to 320ºC. The main goal of analyzing Jojoba oil was easily achieved, including all its heavy major compounds up to and including its minor triglycerides (as shown in figures 1 and 3 below). This is in contrast to standard GC-MS in which the Jojoba oil heavy esters either do not elute or that their elution can not be ensured. Clear and dominant or abundant molecular ions were observed for all the oil mixture compounds, which is in contrast to expectations for standard EI (figure 1 and 3). The Tal-Aviv Molecule Identifier (TAMI) software based on isotope abundance analysis helped in the identification of these large esters that are not included in the NIST library, via the provision of elemental formulas (as shown in figure 2 below). Reasonable chromatographic separation without any peak tailing was achieved with the 5975-SMB, despite the use of short column for extended range of heavy compounds. The analysis took only 17 min, which is over twice faster than with standard GC-MS analysis of heavy compounds. Excellent TIC sensitivity was obtained of >30,000 (peak to peak as shown in figure 3) for the most prominent peak thereby enabling the analysis of minor oil ingredients at the sub 0.1%. Excellent ratio of TIC peek heights to column bleed level was also achieved which further helped in the heavy oil components identification. The 5975-SMB uniquely exhibits uniform response to all the oil compounds thereby uniquely enabled quantitative analysis of the oil composition, unlike with standard GC-MS. The simplicity of the Jojoba oil mass chromatogram and availability of molecular ions in Cold EI uniquely enable the identification of the oil as a material even at low concentrations, for forensic or other applications. Figure 1. 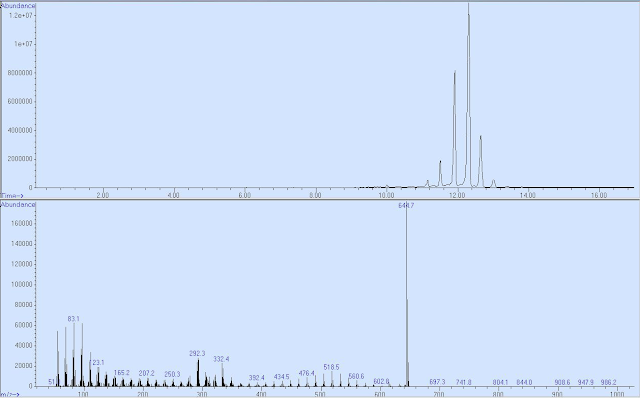 Mass chromatogram (TIC upper trace) of Jojoba oil, and a representative Cold EI mass spectrum of the peak at 12.6 min which eluted after the main peak (bottom trace). Note the dominant molecular ion and rich and informative mass spectrum of this heavy oil ester compound. Click to Enlarge. Figure 2. 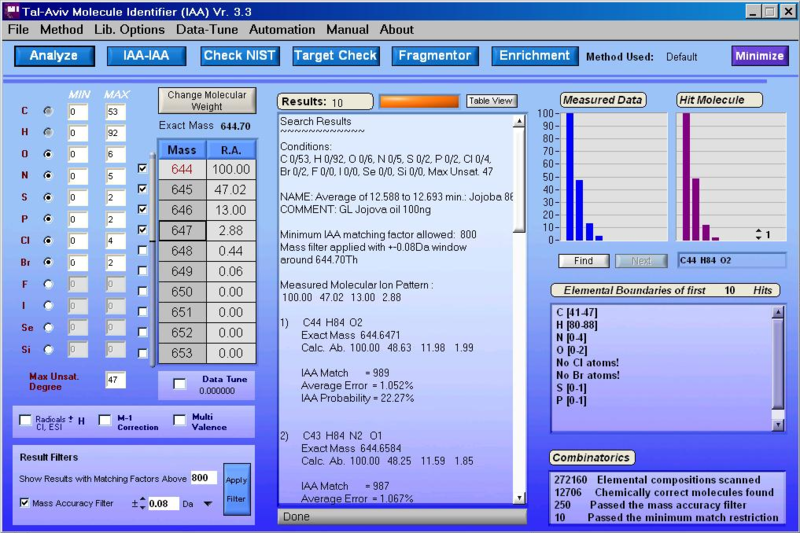 Sample identification using the Tal-Aviv Molecule Identifier software with Isotope Abundance Analysis of the mass spectrum shown in Figure 1 above. As shown, the compound elemental formula was identified as C44H84O2 which is in agreement with literature information on the oil composition. Click to Enlarge. Figure 3. Mass chromatogram (TIC upper trace) of Jojoba oil, magnified 100 times, and a representative Cold EI mass spectrum of the peak at 13.4 min which is the last heavy ester to elute. Note the excellent TIC sensitivity which permits the analysis of trace oil ingredients, including the trace triglycerides eluting after 14 min. Click to Enlarge.